The process of building Packages sometimes results in the Prism Deploy Packager capturing extraneous information in addition to the changes you meant to capture, especially if the installation process required a reboot. If you’re prompted to reboot the PC after installing software, we always recommend doing the reboot before capturing the changes with the Expert. This technote explains how to clean up your Packages before deploying them (one of our recommended “best practices”). We are often asked what information can safely be removed. This isn’t an easy question to answer because each OS is different, and software, hardware and network settings (TCP/IP DHCP, IPX, etc.) will be unique for each customer. One place to start is to determine what changes are generated strictly because of a reboot. Here’s a simple exercise that will help you begin to build your own list of extraneous entries. 1. Take a baseline Picture of a standard PC where you will be building Packages. 2. Reboot the PC, being sure to log back in as the same user as in Step 1. 3. Find the changes to build a Package. The resulting Package will contain information that usually can be safely removed. 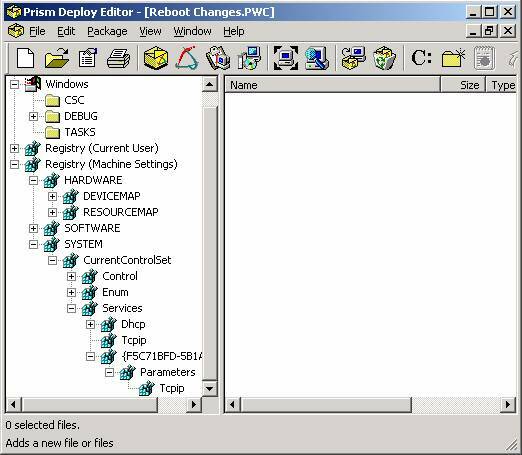 Here’s an illustration of a partially-expanded Package that captured the changes as a result of rebooting a Windows 2000 Professional system. As you can see, a lot happens during a reboot! Most entries like these shouldn’t be distributed with every Package. At first, Package clean-up may seem like a daunting task, especially since many of the registry entries you’ll run across are not at all self-explanatory. But after a while you’ll develop a sense for what belongs in a Package and what doesn’t. To help you develop some guidelines about what to look for, let’s go through a Package from the top looking for extraneous entries. Remember, these are guidelines. Your Packages will vary depending upon what you installed, what operating system the Package was created on, whether or not the system was rebooted, etc. · Registry (Current User)\Software\Microsoft\Windows\CurrentVersion\Explorer. In the illustration below, all keys under the Registry (Current User) are unnecessary, so you could delete the entire Registry (Current User) branch. · Registry (Machine Settings)\HARDWARE\RESOURCEMAP\PnP Manager. You may see a number of values like \Device\xxxxx.Raw or \Device\xxxxx.Translated. All of these can be deleted. · C:\Documents and Settings\Local Settings\History\history.IE5\MSHist……. In this example, the History folder (and its subfolders) could be deleted. In this section, it’s common to find folders called Debug, Tasks, CSC. These can usually be deleted, along with their contents. You may find a file called SchedLgU.Txt – you can delete it. These sections usually don’t have extraneous entries. If something has been captured that you know is unnecessary, delete it. Otherwise, leave these sections intact. The same entries shown in Figure 2 under Deleted Items often appear here too. They can be deleted. Below are some typical examples of items that are usually safe to omit. Your Packages will vary. · Registry (Machine Settings)\Hardware – unless you’re installing hardware device drivers and you’re certain that the entries in this section are relevant, we recommend deleting the Hardware key. · Registry (Machine Settings)\System\CurrentControlSet\Enum (Windows 2000). You’ll see sub-keys such as Display, FDC, IDE, PCI, etc. which relate to the hardware on your system. These are usually safe to omit unless you’re specifically updating hardware. The Root and SW sub-keys often contain relevant information, so don’t delete those sub-keys. · Registry (Machine Settings)\System\CurrentControlSet\Enum\Root (Windows NT4). You’ll see LEGACY_XXX sub-keys. Some are obviously hardware related (LEGACY_CDROM) and usually can be deleted from the Package. Others are related to what you’re installing (LEGACY_NORTON ANTIVIRUS SERVER, for example) and should not be deleted. · Registry (Machine Settings)\System\CurrentControlSet\Enum\\\\Control; value=DeviceReference (Windows 2000). Browse to the related tech note Q10066: "Windows 2000 BSOD or LOOP after Installing a PictureTaker Package" for more information. Prism Deploy Packager automatically ignores certain pre-defined areas that are specified in the RULES.INI file. As you’re cleaning up your Packages, you may find you’re deleting the same items over and over again. To avoid this, you can add new entries to RULES.INI. Doing so will cause the Expert to ignore these entries so they will no longer be captured when taking pictures or finding changes.